2 What can Rhinoplasty treat ? 3 Who are good candidates for Rhinoplasty ? 4 What are the risks of Rhinoplasty ? 5 How to prepare for Rhinoplasty surgery ? Rhinoplasty also known as “nose job” or “nose reshaping” enhances facial harmony and the proportion of your nose. It can also be done to correct impaired breathing caused by structural defects in the nose. In some patients who wants to raise the profile of their nose a silicon implant might be needed. Rhinoplasty is a surgical procedure to correct the shape, size and function of nose. There are many sub-type of procedure inside a nose job. Rhinoplasty Augmentation in which a silicon implant is added to make your nose look more symmetrical, bigger and longer.This is mostly done for people who has low nasal root especially in Mongolian races. Rhinoplasty Reduction also known as hump reduction in which a hump or entire length of nose is reduced including bones so that it looks natural and in symmetrical looking without and humps.It also makes your nose look smoother.This procedure is usually done for Aryan races. Alar Reduction or commonly known as nostril reduction is done to a patient who have flaring of nostrils and/or wide nose base. By doing this procedure the nostril becomes smaller looking which in turn make your nose appearance big and sturdy. Nasal Tip Correction or also known as refine or projection of nasal tip. In this procedure we make the nasal tip more protruded via augmentation with implant or cartilage grafts. What can Rhinoplasty treat ? Who are good candidates for Rhinoplasty ? You are from Mongolian descendant and have blunt nose. What are the risks of Rhinoplasty ? How to prepare for Rhinoplasty surgery ? 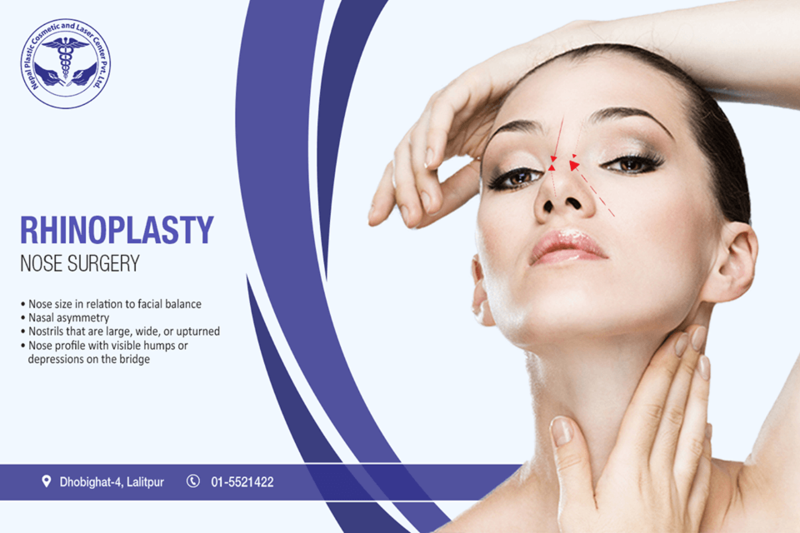 In all above mentioned surgical procedures incision should be made through the inside of the nose so that the post surgical scar should be minimal and well hidden. We provide all these procedure in very competitive price in NPCLC, Kathmandu, Nepal.